In the year of 2017 we saw a change in the habits of Chinese wine drinkers. 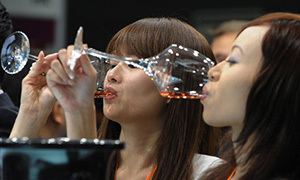 From our regular visits to China we saw a change in the way Chinese people now prefer to drink wine. Those gone by years when people would ‘cheers’ their wine and drink in one gulp is now changing to a much more desired appreciation of the wine in the glass. 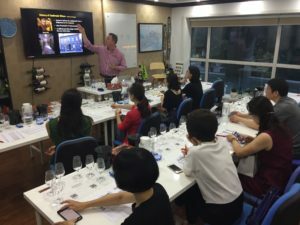 Wine appreciation seminars and training classes are now popping up everywhere in many China cities which are driven by the new wine enthusiast who is desiring higher quality, other interesting styles and greater wine complexities. These are just some of the elements the ‘new era’ wine consumers are demanding. We now find a more important part of our visits to China includes wine presentations and tastings to smaller exclusive groups of wine lovers who are craving the knowledge of western style wines, and in particular our Australian wines. 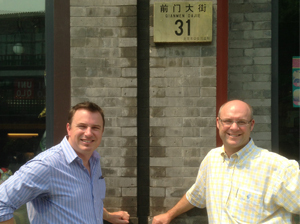 Chief winemaker Hamish Seabrook and marketing manager Dean McCracken enjoy presenting and teaching people during this ‘education’ phase of China’s market for wine. Over the past year it has been recorded that Chinese wine drinkers are appreciating higher quality Australian Wines. As more people can afford to pay more for good quality wines they try, drink and discover how much better higher value wines can be. The Red Kangaroo Wine Company has moved with the times of Chinese consumers and in cooperation with its Chinese distributors released its Premium Quality wine in wine bottles imported from France. Holymount Estate distributor Mr. Hai Tao Li was excited to release the new Blackhedge Shiraz and Cabernet wine produced in Australia’s iconic Barossa Valley. 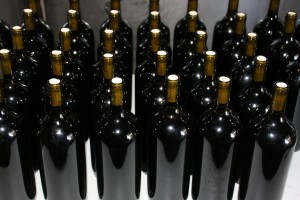 At a recent wine show he said “the success of our highest quality has been fantastic. The year 2016 has been a busy year for The Red Kangaroo Wine Company’s winemaker Hamish Seabrook. 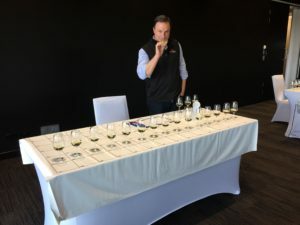 Hamish has become a regular wine judge at many Australian wine shows. Recently pictured at the Cairns wine show, Hamish spent three days tasting and judging 100’s of different wines. Hamish has made comment that the quality of Australian wines is becoming much higher and will mean wine drinkers will hold fantastic memories after drinking our country’s wines. The Red Kangaroo Wine Company’s wine maker Hamish Seabrook was invited by our wine barrel as part of a small group of VIP’s to visit France on a study tour. 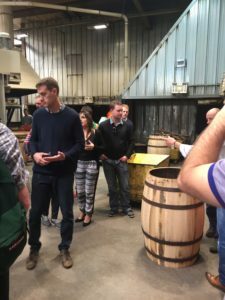 The tour lasted one week and included a comprehensive visit to the barrel making factory as well as many famous wineries including Chateau Margaux, Chateau Pavie just to name a few. As a VIP Hamish was treated to a first class seat in learning the ways of French winemaking techniques and testing some very old French wines. On 11th September 2016 I was invited by the Boutes Barrel company to travel to France to learn about the process of oak barrel production. We arrived in Paris and quickly toured to Allier in the centre of France. Here we experienced the natural and sustainable growth of the oak forest. Very insightful and educational especially to see that the government is quite involved in insuring these forests are re generated and not just logged. There are only so many trees that can be logged each year as it takes some 80 to 100 years to fully mature a tree for oak barrel production. We also witnessed firsthand the harvesting of a tree in the forest and how to select a tree for its quality and suitability for oak barrel production. I followed the tree to the stave mill where I watched it sawn then hand split into individual staves. The staves were then planed, graded and packed. I then travelled to Marcenat in the west of France to see where the staves are aged for 2 years before becoming a barrel. We then travelled to Bordeaux France to watch the manufacturing of the barrels. Here we learnt how to put together a barrel by hand, Bend the stave and have the inside toasted over a fire. 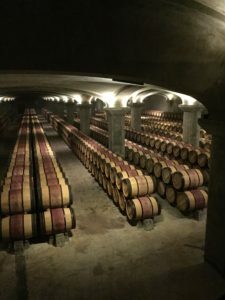 Finally, I witnessed the finished product in some wonderfully generous barrel tastings at Chateau Margaux, Chateau Keriwan and Chateau Marquis d’ Aleseme. 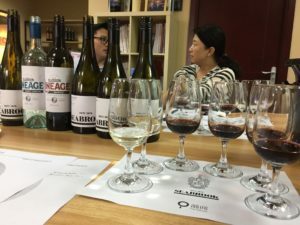 In conjunction with our Beijing wine distribution The Red Kangaroo Wine Company held an information session on our Seabrook Wines brand and wine training of different varieties. The presentation was an outstanding success with all VIP guests telling us how much they enjoyed it. At the end of the presentation a question time was held and many questions were asked about winemaking, wine types and how to store wines. Following CCTV’s visit to our winery in January, sister company China Southern Airlines now serves our Holymount Estate Boroka label wines on its domestic routes. Company owner Dean McCracken said; “Obviously CCTV’s visit to our winery impressed them. 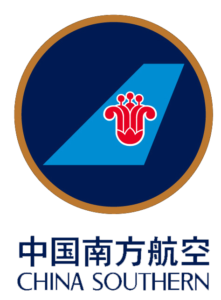 We are excited to make this cooperation and to give the opportunity to all travellers on China Southern Airlines a taste of a quality Australian wine”. 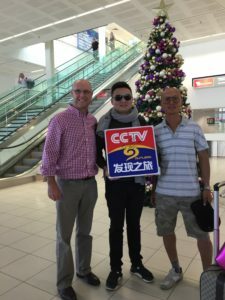 China’s CCTV visited Australia in early 2016 to make a documentary on Australian wine and especially visit our vineyards and winery. For the three days they visited us they learnt about Australia’s way of winemaking in comparison to the traditional French wine making techniques. They also took particular attention to soil types and our climate. 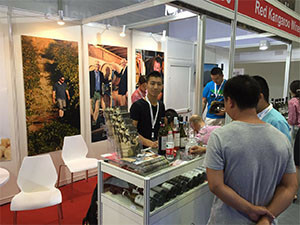 Top Wine China Exhibition June 2015, a great success! 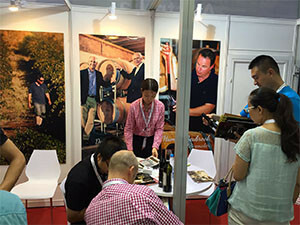 Thank you to everyone who visited our stand at the Top Wine China exhibition in Beijing in June, it was a pleasure meeting you. Over the three days of the event our stand was a hype of activity. Our prominent corner location within the Australian Pavilion provided us with a high profile to the passing traffic of visitors. This show which is mainly targeted to wine industry people meant our enquiries were more relevant to meeting with potential resellers of our wine brands. Hamish Seabrook, Dean McCracken and Jeff Herdman were all present at the show to talk with the visitors. Kathleen, Alysa and Jim were also present to handle any enquiries and help with translating. Since the event Dean has been busy with follow up emails to all those visitors who left their details from an interest in our company. 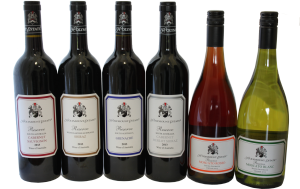 If you have any interests about importing and / or selling our Premium Australian wine, please freely send us an email and we will be more than happy to discuss any interests you have in our wines. 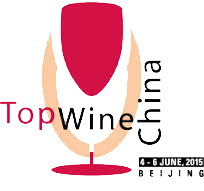 The Red Kangaroo Wine Company Pty Ltd will officially enter its new wine brand ‘Boroka’ into the Chinese wine market in June this year by exhibiting at the TopWine China trade show in Beijing. The show dates being 4th to 6th of June will expose Boroka to hundreds of Chinese wine distributors who will attend the trade show from many provinces around China. 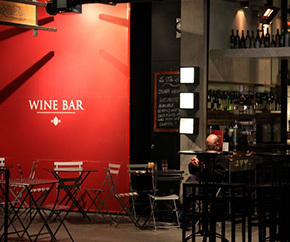 The Red Kangaroo Wine Company and Boroka exhibit will be within the Australian wine pavilion and is stand number 1500. This large, high profile corner stand will provide The Red Kangaroo Wine Company and Boroka brand with fantastic exposure and enormous potential to find a suitable Chinese partner. New releases of Boroka’s ‘The Pinnacle’ Great Western Shiraz and ‘The Pinnacle’ Coonawarra Cabernet Sauvignon will be a feature of the show. These wines have been bottled under cork into taller super premium bottles to suit Chinese wine consumers. Attending the wine show will be Boroka family member Dean McCracken, winemaker Hamish Seabrook, and sales manager Jeff Herdman. In recent meetings with our China distributor Beijing Dihaoshuode Trading Company, the design of the new Holymount Estate ‘Reserve’ range was extensively discussed. The outcome was to increase the range with 3 more Red wines (a Cabernet Sauvignon, Grenache & Cabernet Merlot Shiraz) as well as NEW Sparkling wines. In conjunction with the new wines the product packaging has been greatly improved with all wines in the Reserve range now being packed in Holymount branded printed cartons. Export Marketing Manager Dean McCracken was quoted “This new look of the Holymount Reserve range places the Holymount brand at the forefront of the China wine market. The high quality, reasonable prices, and an extensive distribution network make our wines accessible to more Chinese wine drinkers. This is an exciting era for Holymount Estate”. 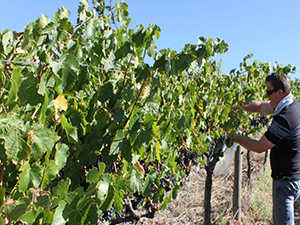 During vintage (harvest time of grapes) the Red Kangaroo marketing team stepped out into the vineyards with winemaker Hamish Seabrook to get a close up view of vintage time. The marketing team followed Hamish around the vineyards while he analysed the grapevines and talked with vineyard managers to determine when the perfect time was to harvest the grapes. Hours of video footage and hundreds of photos were taken to arrive with an end result which was absolutely spectacular…….! 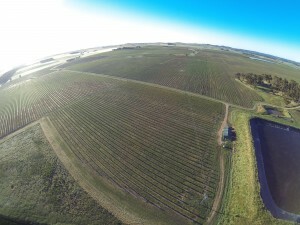 A 13 minute video diary of Hamish’s role was created and uploaded to YouTube which consists of Hamish’s commentary, aerial footage of the vineyards, and a unique video of the grapevine harvesters working at night. This stunning video has been presented to a number of Chinese customers with create interest. You can view this video by simply clicking onto the YouTube links in this website. To assist with the marketing of the Red Kangaroo Wine branding throughout Asia, the company invested in some aerial photography. Experience the grandeur of the Red Kangaroo vineyard and processing plant. Located in one of Australia’s top wine growing areas of South Australia this aerial footage features breathtaking views of this vast and beautiful landscape. (Footage recorded in October 2013). In appreciation and celebration to the success of the Holymount Estate & Seabrook wines in China and the request by our Chinese distributor, the management team worked together to ‘hand bottle’ a special Limited Edition of 1.5 litre magnum bottles to be used as gifts. Exactly 228 bottles of 2009 Holymount ‘Blackhedge’ and 210 bottles of 2006 Seabrook ‘The Chairman’ were hand bottled by Hamish, Jeff and Dean. Each bottle label was hand signed by the winemaker and given a bottle number. The process began with Dean hand-filling each bottle, and Jeff hand corked the bottle with specially printed high quality pure corks. Hamish then sealed the cork and bottle’s top by dipping the bottle into a wax mixture. This provided a very impressive ‘hand-produced’ finish. Finally the labels were adhered onto the bottle before placing into cartons and ready for shipment. More pictures of this ‘Limited Edition’ hand bottling can be viewed in the picture gallery. On the back of another fantastic award rating by James Halliday’s Australian Wine Companion 2014, Chief Winemaker Hamish Seabrook and Marketing Manager Dean McCracken recently visited the China market to promote this outstanding achievement. During their visit they met with key distributors and potential cooperatives for new lines of wine products which will be released in 2014. A visit to Tiananmen Square and ‘Qianmen Dajie’ (Chairman Street) provided an ideal opportunity to take some photos and enjoy site seeing. The outcome of the visit will provide an exciting future for The Red Kangaroo Wine Company and Seabrook Wines future and commitment to the China wine market. The 2014 edition of James Halliday’s Australian Wine Companion which is regarded as the ‘wine bible’ of Australian wine, has again rated Seabrook Wines as a 5 Red Star Winery. Chief Winemaker Hamish Seabrook was excited to receive the news which supports his quest to continue producing high quality wines which the Seabrook family has built their reputation from since 1878. Every wine which was judged scored well into the 90 + points; Seabrook ‘The Merchant’ Barossa Valley Shiraz – 95points Seabrook ‘The Chairman’ Great Western Shiraz – 94 points Seabrook ‘The Judge’ Eden Valley Riesling – 93 points This is another exceptional result for the Seabrook Winemaking family. 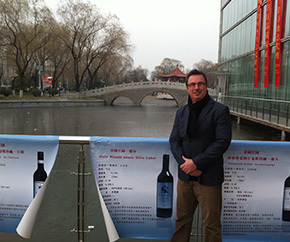 In December The Red Kangaroo Wine Company’s winemaker Hamish Seabrook visited the Chinese market to support the activities of the company’s key distributors. 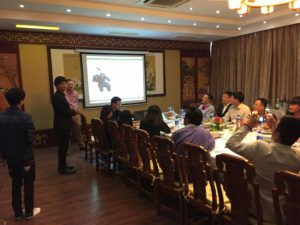 This was Hamish’s first visit to China and he meet with distributors and potential clients. As part of Hamish’s itinerary he presented the history of the Seabrook Winemaking family to delegates at a Beijing Wine Exhibition. 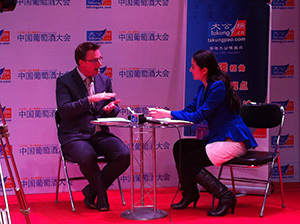 Being the only Australian winemaker in attendance at the exhibition local media services including CCTV and Takungpoa were present and took the opportunity to interview Hamish about the Australian wine industry and Seabrook Wines. The visit provided Hamish with a great insight into the Chinese wine industry along with the customs, culture and cuisine of the country.